I look forward to joining with you on this beautiful workshop. Please note the early bird booking special if booked by 31 March!! Patricia and Julie share common interests which include enabling people to find their own strengths and power to live their lives in truth, love and peace. Both are drawn together as they open to the wisdom of one another and combine that wisdom to share with others. Both believe in people healing themselves, taking responsibility for their own actions. Both work without judgement and in unconditional love. Patricia has been working internationally for the past twenty years, assisting people in their connection to the Earth, to their Soul and to their own heart, healing the fear that keeps people from following their heart. She is the founder of New Gaia Network an organisation that supports people in their journey to their own spiritual life and is editor of a monthly newsletter called 'Dragon's Talk'. 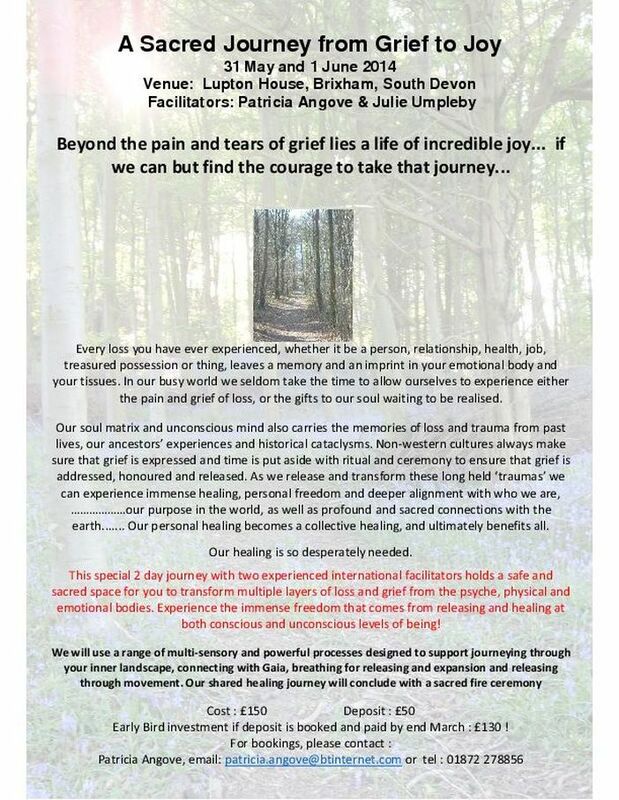 Patricia is also a facilitator of transformational healing and runs training courses for those who wish to use transformational healing with others.